About a year and a half ago I took a look at the indie puzzle game Slayaway Camp. While I have never been much of a fan of slasher/horror films, I thought Slayaway Camp did a fantastic job making fun of the genre while also being a satisfying puzzle game. I bring up Slayaway Camp because today’s game Friday the 13th: Killer Puzzle is Blue Wizard Digital’s followup to Slayaway Camp and it shares a lot in common with its predecessor. While Friday the 13th: Killer Puzzle is basically a re-themed version of Slayaway Camp with new puzzles, it is still a really satisfying puzzle game. We at Geeky Hobbies would like to thank Blue Wizard Digital for the review copy of Friday the 13th: Killer Puzzle used for this review. Other than receiving a free copy of the game to review, we at Geeky Hobbies received no other compensation for this review. When I say that Friday the 13th: Killer Puzzle is a re-themed Slayaway Camp I mean it. The game utilizes all of the same mechanics as Slayaway Camp while adding new puzzles and the Friday the 13th theme. In Friday the 13th: Killer Puzzle you play as Jason Voorhees on his killing spree. Like with Slayaway Camp the gameplay revolves around slide puzzles. The goal of each puzzle is to kill all of the civilians. To kill the civilians you have to move Jason around the map so he runs into all of them. This is not so easy as when you choose a direction Jason will continue moving in that direction until he runs into a person or another obstacle which will stop his movement. The levels are setup in a way that you have to find the right set of movements in order to get Jason to all of the people on the map. As you progress through the game there are more mechanics introduced including objects you can use to help kill people, police and other things you have to avoid to prevent yourself from dying, cats that you aren’t allowed to kill, escape paths, telephones that attract people, teleporters and other mechanics that change up the gameplay. Some people might think calling Friday the 13th: Killer Puzzle a re-themed Slayaway Camp should be taken as an insult. I don’t really see it as an insult as I thought Slayaway Camp was a good game. I basically see Friday the 13th: Killer Puzzle as a sequel/expansion pack to Slayaway Camp. It doesn’t really add any new mechanics but it does succeed in adding more interesting levels to solve. As the two games are basically the same, your feelings about one game should be the same as those of the other game. If you liked Slayaway Camp I can’t imagine you not also enjoying Friday the 13th: Killer Puzzle and vice versa. If you didn’t care for Slayaway Camp I don’t see you changing your mind with Friday the 13th: Killer Puzzle. As I already reviewed Slayaway Camp I am not going to waste time repeating things that I mentioned in that review. Instead I am going to focus on what is unique in Friday the 13th: Killer Puzzle. So before talking about the theme I have to admit that I have never seen any of the movies in the Friday the 13th series. I only have some basic knowledge about the franchise as a whole. Not having seen any of the films in the franchise I will admit that I can’t give you much of an opinion of how well the game handles the theme. I can tell that the game embraces the theme though and has some little touches here and there. There has also been a graphic overhaul since Slayaway Camp which I like. It still maintains the cartoony style but I would say that the graphics are an improvement over Slayaway Camp. While on the topic of graphics I want to quickly address that Friday the 13th: Killer Puzzle includes both a PG and R mode. Basically the difference between the two modes is that the PG mode removes all/most of the blood that is present in the R mode. Otherwise the two modes are exactly the same as both modes still include the over the top violence. It may not actually impact the gameplay but I applaud the decision to include both a PG and a R mode since it gives players some options if they want to reduce some of the violence in the game. It has been a while since I have played Slayaway Camp but from what I remember I would say that that Friday the 13th: Killer Puzzle is a little easier than Slayaway Camp. The puzzles are still well designed and challenging but I would also say that they are a little more accessible to people that don’t play a lot of puzzle games. Basically I would say that the game’s difficulty ramps up slower than it did in Slayaway Camp. The game is also more forgiving with regards to hints/solutions. In Slayaway Camp you had to use some of your currency in order to buy hints/solutions. This is not necessary in Friday the 13th: Killer Puzzle. I would also say that the hints are much more helpful since some of the hints in Slayaway Camp weren’t helpful while the hints are usually quite helpful in Friday the 13th: Killer Puzzle. Basically I would say the puzzles are still challenging in Friday the 13th: Killer Puzzle but you also avoid some of the frustrating puzzles from Slayaway Camp. So I am now going to address the fact that Friday the 13th: Killer Puzzle is a “free to play” game. This will probably make a lot of people skeptical of the game since free to play games don’t always have a great track record as they regularly become “pay to win”. The good news is that Friday the 13th: Killer Puzzle is one of the good free to play games. The game has some premium content but you don’t have to pay for it if you don’t want to. In the free version of the game you get eight of the episodes for free. Each episode consists of 13 levels (fitting isn’t it) so you can play 104 puzzles in the game without paying anything. The game also includes a daily puzzle and a mini game where you can see how many of the finishing attacks you can complete in a row. While playing the game you will unlock “bloodlust” which will unlock some weapons that you can equip Jason with. These weapons have no impact on the gameplay and are mostly cosmetic. You will unlock weapons naturally through play but you can also pay extra money in order to unlock more weapons in a “loot box” type mechanic. This is totally optional though as you can play the game perfectly fine without having to purchase any. In addition Friday the 13th: Killer Puzzle also includes four DLC packs and some costume packs. Each of the four DLC packs include another set of thirteen levels, a costume that fits the theme of the levels, and a special weapon to go along with the costume. Each DLC pack costs $2.99 while the costume packs are $0.99. I have checked out some of the DLC packs and I would say that they contain some of the best puzzles in the game. Since they are meant to be played after the free episodes they are also the hardest puzzles in the game. Since you have already been introduced to all of the other mechanics throughout the free episodes, the DLC puzzles are free to mix and match all of the mechanics which leads to some interesting puzzles. For a lot of these puzzles you have to think outside of the box in order to solve them. As far as a recommendation it basically comes down to whether you like these type of puzzle games. If you don’t really care for slide puzzles or Friday the 13th, I don’t see you getting much out of the game. If you like slide puzzles, Slayaway Camp, or Friday the 13th I would say that it is worth trying out the game. It is free after all with no necessary purchases for the free levels. If you enjoy the free levels and want some more challenging and creative levels, you may want to check out the DLC packs. 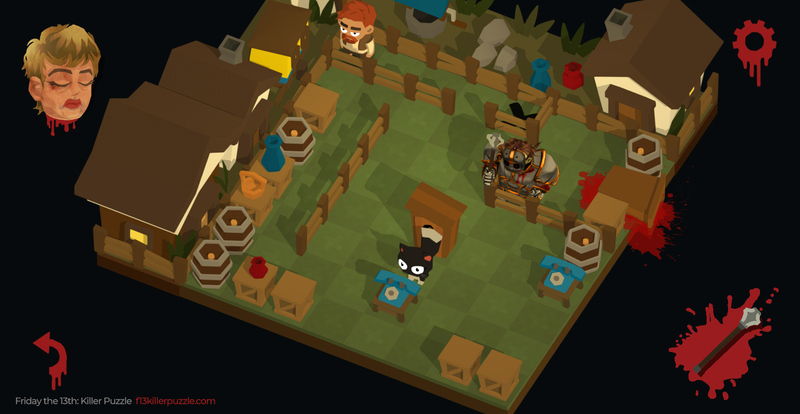 A fun puzzle game with some interesting puzzle design. A good example of what a free to play game should be. Doesn't add any new mechanics to Slayaway Camp. If you don't like slide puzzles the game is not going to be for you.